Starting your baby on solid food is an exciting milestone, but it can also throw in a wrench to how you cook for your family. Do you now need to prepare a separate meal for your baby to eat? Do you need to cook two different meals: one for your family and one for your baby? Ideally, when it comes to feeding your family, the simpler, the better - right? While you cannot expect everyone in your family to want to eat the same things or even like everything that is being served, it is not realistic for you to be a short-order cook. Nor should you be expected to make multiple dishes for the sake of having something that everyone will want to eat. This is just not sustainable for mama’s sanity. Planning and preparing meals that your baby can eat should be approached in the same way: keep it simple. How can you meal plan for your family while incorporating food that your baby can also safely eat? Baby-led weaning (BLW) is a way of transitioning a baby to solid foods by allowing them to self-feed healthy, whole foods from the start. This approach allows baby to be introduced to a variety of foods while creating a positive, feeding environment from which baby learns how to eat. What can you expect with baby-led weaning? With the baby led weaning approach, it is encouraged to offer your child whole foods right from the start, rather than spoon-feeding pureed food. This method of introducing solids allows babies to eat foods prepared for the whole family, which exposes them to a greater variety of nutrients while creating a more adaptable eater. Research has found that infants who follow the baby led weaning approach to eating are less like to be fussy eaters and more open to trying different foods. Following baby-led weaning can also make meals simpler for you, as you’re not needing to prepare different foods for baby. That means you can skip the purees and forego baby-food making, saving yourself time in the kitchen and money at the grocery store. With baby-led weaning, you can simply offer your baby table foods that you have already prepared for your family, provided that they are appropriate for baby. Rice, Casseroles, Risottos: The soft texture and spoon-stickiness makes these dishes an excellent baby food option. Breakfast: Many popular breakfast items are great for little fingers to grasp, including eggs, toast, pancakes, quiches, fruit, yogurt, oatmeal, and more! The majority of family meals can somehow be modified to safely share with your baby, which means simplified cooking and meal preparation for you, mama. 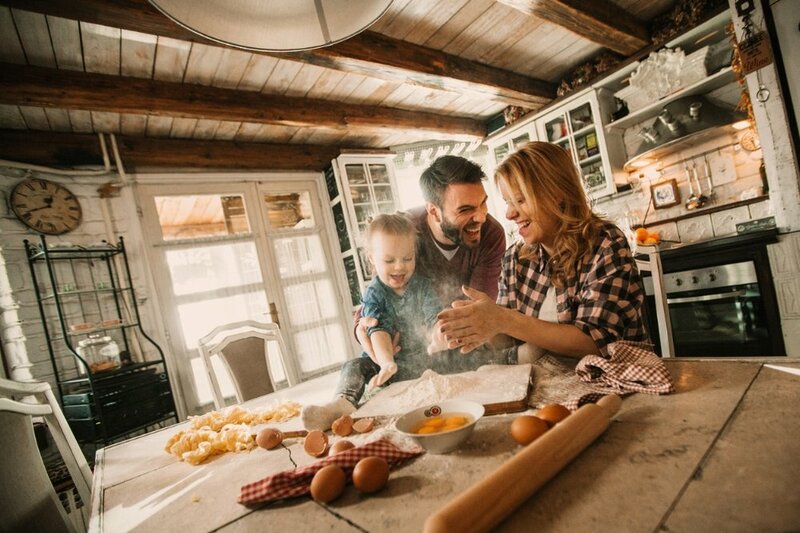 If you want to nurture healthy eating habits in your kids, starting from when they are babies, it is important to be intentional about regular family meals. This doesn’t mean you need to have every single meal together as a family, because that is not realistic. What it does mean is that your family needs regular times to eat together to create healthy eating behaviors. You will be more likely to give your baby more chances to be exposed to a variety of foods when you are creating consistency with meal planning and feeding schedules for your family. If this feels overwhelming, start out slow and take small, intentional steps toward creating and having family meals which your baby can also take part in. Remember - it doesn’t have to be perfect to be effective. You’ve got this mama!